Select requirements to view suitable cameras instantly from our entire range. 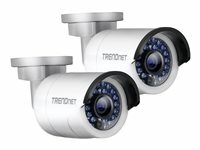 Trendnets Outdoor HD PoE Network Fixed Bullet Camera provides powerful HD night vision in complete darkness. An ultra-compact camera which is outdoor ready with an IP66 weather rated housing. Each model comes with a free Apple® and Android™ mobile app and Complimentary pro-grade software to manage up to 32 TRENDnet cameras. The Outdoor 1.3 MP HD PoE IR Network Camera, model TV-IP320PI, provides powerful 1.3 megapixel HD night vision in complete darkness for up to 30 metres (100 ft.). This ultra-compact camera is outdoor ready with an IP66 weather rated housing. It comes with a free Apple® and Android™ mobile app and Complimentary pro-grade software to manage up to 32 TRENDnet cameras. The ability to connect the camera to an existing WiFi (2.4 GHz) or PoE network offers installation flexibility. 960p video (1.3 Megapixel) at 30 fps in H.264 compression and 30 meter rated night vision provide 24 hour surveillance. Built for extreme environments with an IP66 weather rating and an operating temperature range of -30 – 60 °C (-22 – 140 °F). 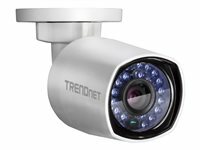 TRENDnet’s Outdoor 3 MP Full HD 1080p PoE IR Network Camera, model TV-IP312PI, offers night vision up to 50 metres (164 ft.), an IP66 weather rating, and an integrated mounting bracket. Ultra energy efficient advanced infrared creates a more balanced night vision illumination field and reduces close object overexposure. Record 3 Megapixel HD video (2048 x 1536) at 20 fps in a space saving H.264 compression format. Manage up to 32 TRENDnet cameras with included complimentary software and mobile apps. Powerful 3 Megapixel video (above Full 1080p) at 30 fps in H.264 compression and 50 meter rated night vision provide 24-hour surveillance. Built for extreme environments with an IP66 weather rating and an operating temperature range of -30 – 65 °C (-22 – 149 °F). Advanced infrared LEDs provide improved night vision and significantly reduce close object overexposure—common with standard infrared LEDs. Powerful night vision Night vision with advanced infrared noise reduction. Advanced IR technology Ultra-energy efficient advanced infrared creates a more balanced night vision illumination field and reduces overexposure of close objects in the center of the viewing field. Outdoor rated Built for extreme environments with an IP66 weather rating and an operating temperature range of -30 - 65°C. PoE Compatible with IEEE 802.3af PoE switches and extenders. Integrated mounting bracket Integrated articulated mounting bracket supports most installations. D-WDR Improved image quality in high contrast lighting environments with Digital Wide Dynamic Range technology. Recording schedule Define a weekly hybrid continuous and motion detection recording schedule. The Indoor / Outdoor 4 MP PoE Day / Night Network Camera, model TV-IP314PI, provides powerful 4 megapixel night vision in complete darkness for up to 30 meters (100 ft.). Even in extreme environments, this ultra-compact camera will function all year, thanks to an IP66 weather-rated housing. Use the included pro-grade software to manage up to 32 TRENDnet cameras, or download the free iOS® or Android™ mobile app. Powerful 4 MP video at 20 fps in H.264+ compression (2 MP 1080p at 30 fps) and 30 m night vision provide 24-hour surveillance. PoE offers cost savings and the flexibility to install this compact bullet camera in the desired location. Built for outdoor environments with an IP67 weather rating and an operating temperature range of -30° – 60°C (-22° – 140°F). TRENDnet’s Indoor/Outdoor 5MP H.265 WDR PoE IR Bullet Network Camera, model TV-IP316PI, provides day and night surveillance with a night vision range of up to 30 meters (98 ft.) This IR bullet network camera delivers year-round surveillance with an IP67 weather rated housing to withstand harsh environments. Record up to 5MP video (2944 x 1656) at 20 fps in a space saving H.265 compression format. View live video with included complimentary software and mobile apps. Powerful 5MP video in H.265 compression and 30m night vision provides 24-hour surveillance. Masked IR LEDs provide covert night-time viewing invisible to the human eye. PoE offers cost savings and the flexibility to install this IR bullet camera up to 100m (328 ft.) from the PoE source equipment. 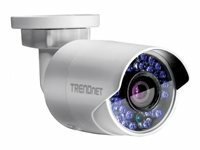 TRENDnet’s Indoor/Outdoor 8MP 4K H.265 WDR PoE IR Bullet Network Camera, model TV-IP318PI, provides day and night surveillance with a night vision range of up to 30 meters (98 ft.) This IR bullet network camera delivers year-round surveillance with an IP67 weather rated housing to withstand harsh environments. Record up to 8MP 4K UHD video at 20 fps in a space saving H.265 compression format. View live video with included complimentary software and mobile apps. Powerful 8MP video in H.265 compression and 30m night vision provides 24-hour surveillance. Masked IR LEDs provide covert night-time viewing invisible to the human eye. 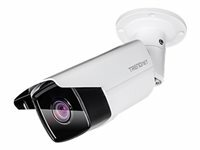 TRENDnet’s Indoor/Outdoor 5MP H.265 WDR PoE ENHANCED IR Network Camera, model TV-IP313PI, provides day and night surveillance with a night vision range of up to 80 meters (262 ft.). ENHANCED IR uses powerful energy efficient infrared LEDs to produce a balanced night vision illumination field and reduces close object overexposure. 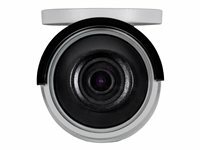 This network camera delivers year-round surveillance with an IP67 weather rated housing to withstand outdoor environments. Record up to 5MP HD video at 20 fps in a space saving H.265 compression format. View live video with included complimentary software and mobile apps. Advanced ENHANCED IR LEDs provide long-range night vision and significantly reduce close object overexposure—common with standard infrared LEDs. Advanced ENHANCED IR LEDs provide long-range night vision up to 80m (262 ft.) and significantly reduce close object overexposure—common with standard infrared LEDs. TRENDnet’s Indoor/Outdoor 2MP H.265 WDR PoE IR Bullet Network Camera, model TV-IP326PI, provides day and night surveillance with a night vision range of up to 30 meters (98 ft.) This IR bullet network camera delivers year-round surveillance with an IP67 weather rated housing to withstand outdoor environments. Record up to 2MP 1080p HD video at 30 fps in a space saving H.265 compression format. View live video with included complimentary software and mobile apps. The Indoor / Outdoor 1.3 MP HD PoE IR Network Camera Twin Pack, model TV-IP320PI2K, comes with two TV-IP320PI cameras which provide powerful 1.3 megapixel HD night vision in complete darkness for up to 30 meters (100 ft.). The ultra-compact cameras are outdoor ready with an IP66 weather rated housing. They come with a free iOS® and Android™ mobile app and Complimentary pro-grade software to manage up to 32 TRENDnet cameras. TRENDnet’s Indoor 2 MP 1080p WDR Mini Pan / Tilt PoE IR Network Camera, model TV-IP410PI, provides day and night surveillance with a night vision range of up to 10 meters (32.8 ft.) This mini pan / tilt network camera features adjustable wide dynamic range (WDR) image balancing that enhances image quality and clarity when exposed to high contrast lighting environments. Record 1080p video (1920 x 1080) at 30 fps in a space saving H.264+ compression format. Manage up to 32 TRENDnet cameras with included complimentary software and mobile apps. Adjustable wide dynamic range (WDR) image balancing that enhances image quality and clarity when exposed to high contrast lighting environments.